With an experienced team of senior ERP and CRM consultants, we help medium-sized distribution enterprises in Texas take their operations to the next level with NAV-X. Quote it, Fix it and Invoice it. Sounds simple, but it’s easier said than done. It is not uncommon to find yourself maintaining quotes on one system, while collecting time on another. This information then has to be re-entered, validated and confirmed within each system. Finally, the data is consolidated into “The Invoice”, all in the hope that it is complete. What was once a simple task has evolved into an expensive problem. The needless complexity started way before the invoice. Just think through what it takes to quote a large equipment repair. Gaining shop floor control with a solution like Dynamics AX has never been more pertinent. There are various software applications on the market to facilitate fundamental project processes. These processes are linked by the results they produce and are efficiently communicated using these systems alerts, reports and dashboards. Which software applications does your business need? 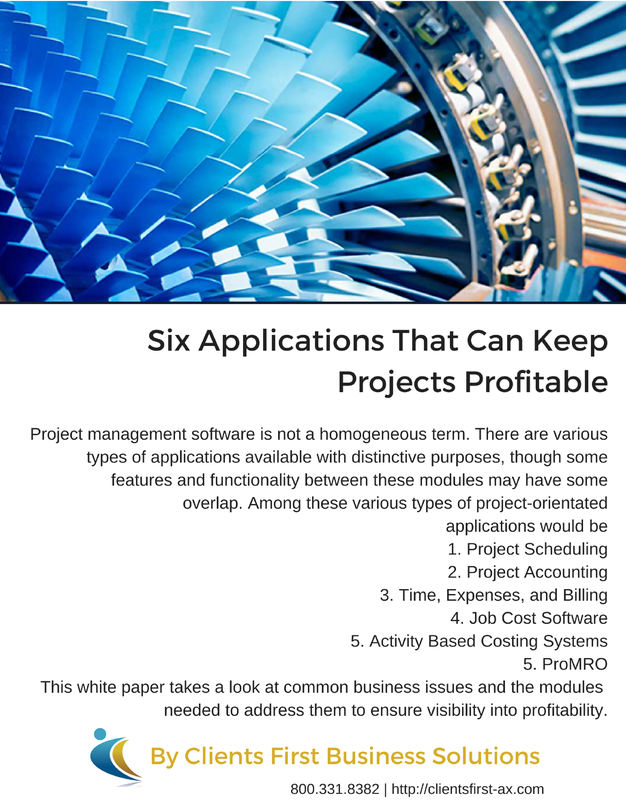 Read this report to get a better understanding about Project based software applications. You’re afraid that the cure might hurt more than the pain of inefficiency. At Clients First, we understand this. We have a solid track record of working with Dynamics 365/AX Shop Floor Control and MRO companies that repair equipment. We know that the problems differ from small to large equipment repairs. We know that budgets are important, because they help you spot problems before they become unmanageable. Inventory varies between the consumables and the raw materials. Labor applied to the job is expensive. This is where the costs are hidden. Clearly, a basic understanding of business is fundamental. It’s even more important to realize that your Maintenance, Repair and Overhaul business is unique. Dynamics 365/AX Enterprise software for Maintenance, Repair and Overhaul (MRO) allows users to quickly create quotes. With the ability to turn quotes into projects with the click of a button, it’s no wonder Dynamics is the top choice for MRO businesses. Dynamics invoice requirements are both different for Time and Material Projects as well as Fixed-Price Projects. Despite this, Dynamics handles both with built in flexibility for individual business needs. Dynamics reporting software for Maintenance, Repair & Overhaul (MRO) organizations allows users to manage reports with extensive options such as PowerBI, SQL Reporting Services, Excel, etc. Reporting is flexible and based on your organization’s specific needs. Clients First starts with a complete system supplied by one of the largest software providers. We then add features that are important to your business. Our solution is built on the updated Dynamics 365 Enterprise/AX software. It is a full-featured Enterprise Resource Planning system for MRO that can service the needs of small and large businesses alike. We have successfully implemented Microsoft Dynamics AX for large global entities spanning 11 countries, currencies and complex requirements. Our team has experience implementing modules such as Dynamics Shop Floor Control, ProMRO, Trade and Logistics, Production and Projects to deliver the solution your company needs. Clients describe us as “dependable”, “prepared”, “reasonably priced”, “knowledgeable” and “responsive”. And we treat all clients the same. At Clients First, we put you and your business first.